Last night I went to bed and felt so happy, so content and so very thankful for all Jesus has done for me. I just kept thanking Jesus for everything until I fell asleep. Sometimes I get still and get overwhelmed with what Jesus has done for me, what Jesus has taught me and the great mercy that He has had on my life! I looked back and found an email I sent you a while ago and attached it (below). It was sweet to read it, but what is even sweeter is how He is still doing for me, He is still teaching me and He is still having mercy on my life! What a sweet Savior, what a precious friend! I never want to forget what He does for me, how He loves me and how He keeps me. At the bottom in red are the things I have added! I know there is much much more……….but it’s still wonderful to think on these things! 5. Leave something with people you see – even if it’s just a smile. 7. We are different from the world because of the spirit that dwells within us – not because of our outward appearance or ceremonies. 8. The holy Ghost will dwell in an unclean temple…..God is merciful. 10. You can have a perfect heart and still make mistakes. 17. You must be able to stand open before God before you can have perfect fellowship with His saints. 23. If you know the truth, all the counterfeits will be obvious. 33. Happiness comes from God…. not the world. 34. Jesus is my bestest friend….. He has never left me alone. Ever. When I came to your house two years ago, I thought I was lost and didn’t have a chance. Just look at what the Lord has done for me! I’m so thankful for His mercy. I’m thankful that in this great big world, He looked down and saw me and my family and led us to you….. all of you! There is nothing that God can’t do……for anyone. 39. The joy that comes in the morning…. afternoon…. and night. What a wonderful life, Pastor John! Even in times of trouble, heartache, sickness and pain, He makes it all worth it. We are truly blessed! It has been an amazing week, seeking the answer to the question you asked me:”Where was Christ when He was sacrificed?” I did find the answer and had a wonderful week with Jesus. When I got home from the OT study last Sunday, Jesus put a question on my heart (this is before doing any homework or listening to a disc). I was talking to Jerry and I asked him “How did people do the right thing without the law written on their hearts?” I had never really thought about that. That was just the beginning. It seemed like everyday Jesus was putting a question on my heart and answering it the same day. He seemed to be two steps ahead, whispering the question and then gently guiding me to the answer. Today dispatch sent me two hours away, to Philpot Ky. The entire drive this question was just heavy on my heart. I felt like it was right there, but that I couldn’t see it. So I told Jesus “Lord, sheep are not very smart and the shepherd has to lead them… Will you help me find the answer?” I think I made reference to the blind man Jesus healed too. Anyway, after reaching the location, I found out dispatch had made an error and I was supposed to be in Paducah Ky….2.5 hours away. I had to find a parking lot and wait for further direction. While waiting, I went to http://www.goingtojesus.com and found the video on sacrifice, in the OT study. I listened to it three times. While driving home (video was playing), I felt Jesus on my right side. First my right leg got very warm, the air was on high so it seemed odd that I felt that intense heat. Then my arm and shoulder became very warm. I felt like Jesus was sitting next to me, as close as He could sit. I drove the rest of the way home, holding hands with Jesus. It has been so sweet just to have him teach me. I felt so much, watching all of you respond to what God had taught you about this. I can’t find any information that I’m searching for. I know you’ll be able to assist me. I’m trying to get my brain to comprehend the chronology regarding the dates of historical texts. I believe I recall you saying that the Bible stories came first, and others were hand-me-downs throughout other cultures based on here-say knowledge of the Bible stories, told verbally in those days. When was the book of Job written? Much earlier , correct? Moses wrote 600-800 years before the date given here. Even if, as some scholars think, Homer wrote as early as during King David’s time (about 1,000 BC), Moses still came centuries earlier. Some classical scholars have even suggested that there never was a man named Homer, so little is known of him. But the figure of Homer is the “go-to guy” for originations of many ancient Greek mythological concepts. The Iliad and Odyssey, which bear his name as the author, were to classical culture what the Bible used to be to Western Culture. They were basic to education and to the Greek understanding of life itself. The Flood happened 1,656 years after Creation (about 2,500 BC). To my knowledge, nobody holds that the Gilgamesh epic was written before that. Moreover, there are flood stories in many cultures around the globe, all of them originating after the Flood happened, of course, which is a testimony to the reality of the event that is recorded, and was recorded first, in the Bible. All theories of human social development (including mythological development) before recorded history (written history) are based, of course, on evolutionary doctrine, and they have no foundation. The third millennium BC is the farthest back in time that man’s recorded history goes. Everything taught by man concerning events before the third millennium BC, therefore, is guesswork. Isn’t that astonishing, considering how very much is taught to our children concerning the time before there Third Millennium BC? And yes, the story of Job took place very early in history, even before Moses. When it was at last written down, no one knows, or can know. Lastly, while I understand that discussions like this must take place with our children when they are confronted by the skeptical cynicism rampant in the educational system of our decadent culture, let me remind you that nothing convinces souls of the truth of the gospel like the power of God does. Pray that Jesus will touch your daughter. If he does, then what she has heard from men won’t matter to her at all. It won’t even matter to her if the Bible was written last week. She will know the truth, and the truth will make her free. Sorry, I wasn’t able to get to this when you sent it yesterday. I sure liked your answer, though, especially at the end when you say it doesn’t make any difference what a person has heard from men if they have been touched by Jesus to hear and believe the Gospel. There is a lot of physical “evidence” out there to support just about any theory that men come up with, but if someone has truly felt the power of God, that trumps everything else, so that you don’t even have to bother wading through all of the man-made theories to know the truth! As I was reading this my mind started wondering and it made me feel a little overwhelmed. Then I read your last paragraph and it brought such a peace. The truth will set you free and it’s good to know that the “truth” is all you really need to know! You CAN decide you will believe the truth and hang around for a while, maybe years, but you will not last. You can’t last any more than the disciples could last with Jesus through the garden. 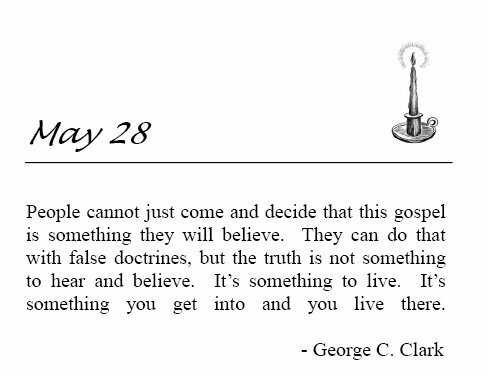 The truth is too much for those who are in the flesh to stay with. They will be pruned out, regardless of how determined you are to stay. God makes all the decisions that have to do with His kingdom, including who inherits it. Deuteronomy 4:1 Ye shall not add unto the word which I command you, neither shall ye diminish ought from it, that ye may keep the commandments of the Lord your God which I command you. Deuteronomy 4:12-14 And the Lord spake unto you out of the midst of the fire: ye heard the voice of the words, but saw no similitude; only ye heard a voice. And he declared unto you his covenant, which he commanded you to perform, even ten commandments; and he wrote them upon two tables of stone. And the Lord commanded me at that time to teach you statutes and judgments, that ye might do them in the land whither ye go over to possess it. 2 Chronicles 34:14 When they brought out the money that was brought into the house of the Lord, Hilkiah the priest found a book of the law of the Lord given by Moses. Ezra 7:3 This Ezra went up from Babylon; and he was a ready scribe in the law of Moses, which the Lord God of Israel had given: and the king granted him all his request, according to the hand of the Lord his God upon him. Nehemiah 8:13 And they found written in the law which the Lord had commanded by Moses, that the children of Israel should dwell in booths in the feast of the seventh month. Conclusion: The law of Moses was called “the law of Moses” only because Moses was the man through whom God gave His law to Israel. Moses did not come up with one sentence of the law; in fact, God forbade him to do so.